Anyone have a link to a pic of the Playa Bowling Alley that was set up 2013? I scrolled thru the 2013 gallery and couldn't find anything. I could only find em through a Google search. 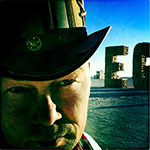 I'm giving this a nudge over to the Experiences At Burning Man board, since that's a better fit for threads posting or looking for pictures from Burning Man. I believe it was called the Toilet Bowl, and was on the playa in both 2012 and 2013 (part of the project to help build art that's lit up at night at the open playa port-a-potty banks.